Optimus Prime gets reincarnated in one of the the newest popularly awarded American TV series “Transformers Prime”. This series blends in designs from previous Transformers series, particularly the Movie and Animated lines. The first toy model of the popular Autobot leader was thankfully released in the First Edition toyline. Does he live up to the standards of a Prime? Let’s find out. F.E. 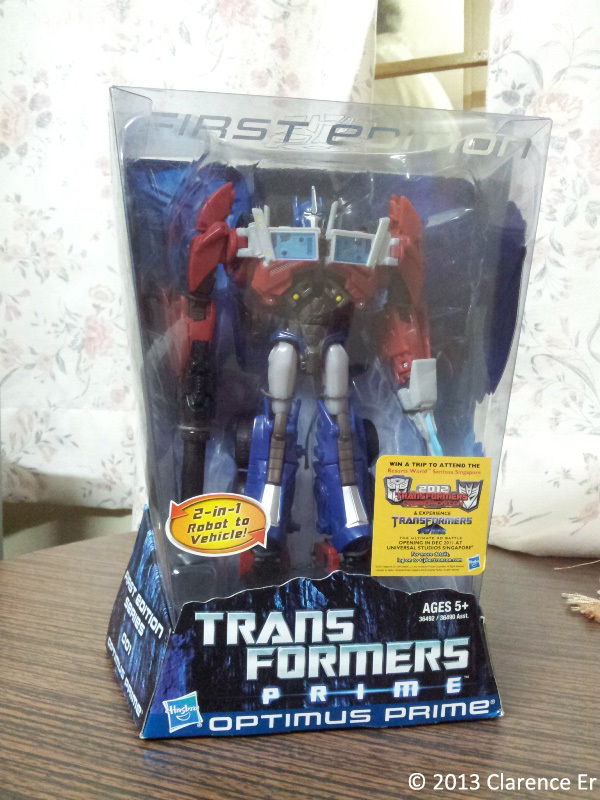 Optimus Prime comes boxed in a beautiful clear and blue packaging, and is packaged in robot mode. You get to see a nice standstill pose of him within the clear plastic and the nice dark blue colours add to the feel from the Transformers Prime show. But as always, we’ll start with the alt mode. F.E. 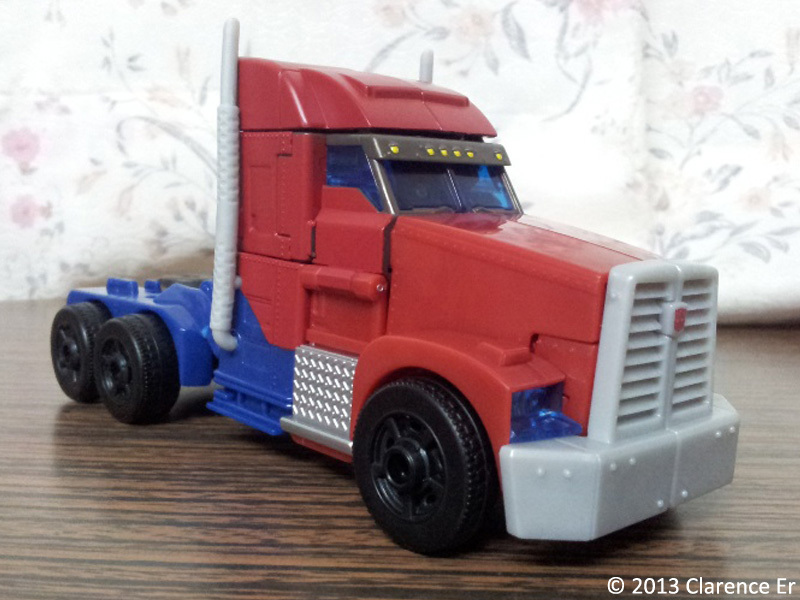 Optimus Prime’s truck mode is not only show accurate, but takes a lot of elements from the movie design. It greatly resembles the Peterbilt truck and this time without the pimped flames deco. 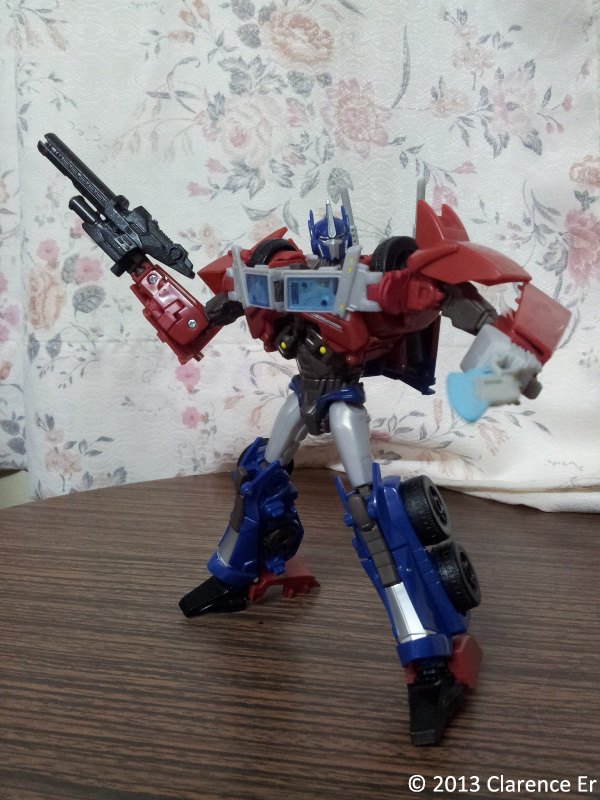 Having the trademark red-and-blue colours of Optimus Prime, this figure is excellent. Dull grey plastic has been used for the grill and other parts of the truck but it doesn’t detract from the nice looks of the truck mode. Two issues have been noted. The back of the truck is not covered and some junk is visible. Also, the back part of the truck also does not peg in securely anywhere and tends to bend out of position with sufficient force. An option has been provided to place Optimus Prime’s robot weapons in peg holes near the rear side of the truck. It’s silly-looking but better than not having any weapon storage. Overall though, the truck mode is very nice and flushed. The transformation is quite simple yet well engineered. It is notably similar to the transformation of the Deluxe class version of the character, which is no issue at all since the Voyager Class figure pulls off the robot mode much better than the Deluxe one could. Robot mode is beautiful! He is almost 100% show accurate and the fact that he has a very flat backpack while being as show accurate as possible is an engineering feat. The body proportions are good and also emotes the Prime leader-like character. The figure is quite well articulated and he can pose in many different ways. The front leg pieces formed from the top of the truck mode can be loose and like to pop off easily, but they are not severely loose and can be fixed easily. The back pieces also don’t peg anywhere into place and tend to move as you play or pose with the figure, but it’s not a huge deal really. The head is only on a swivel joint, and it’s still good although it would’ve been great if it were a fully articulated ball joint instead. Paint apps suffer a little though. Not a lot of paint apps have been applied here, especially in the torso area. A little personal modifying is more than welcome if you’d like. Optimus Prime can wield his nicely decorated gun, which is made of black plastic fitted with sparkly silver glitter designs. 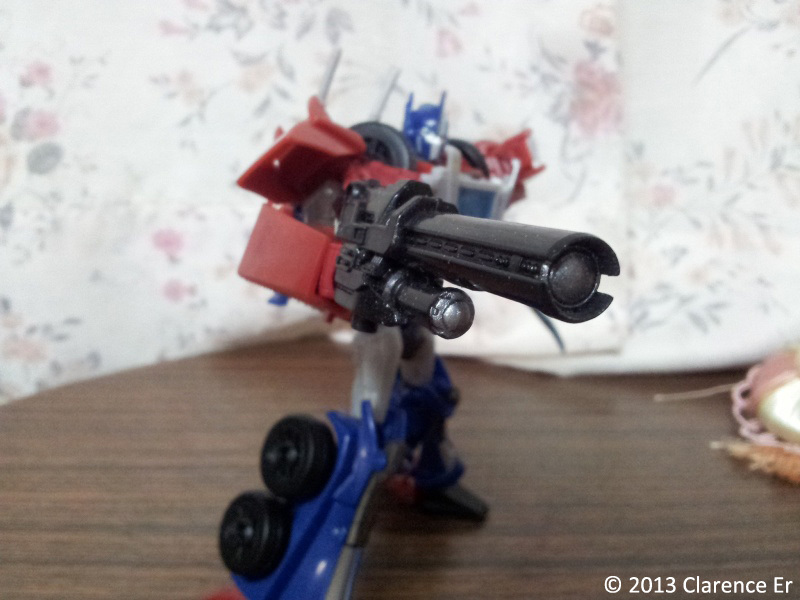 Mounting the gun in one of Optimus Prime’s hands gives the illusion that he has a gun arm thanks to the outer panels of the gun. A very nice touch. His other weapon is the weaker of the two and also probably the only negative point to the figure. It is made of very soft rubbery plastic and quite badly painted only with AllSpark baby blue on one side of the blade. 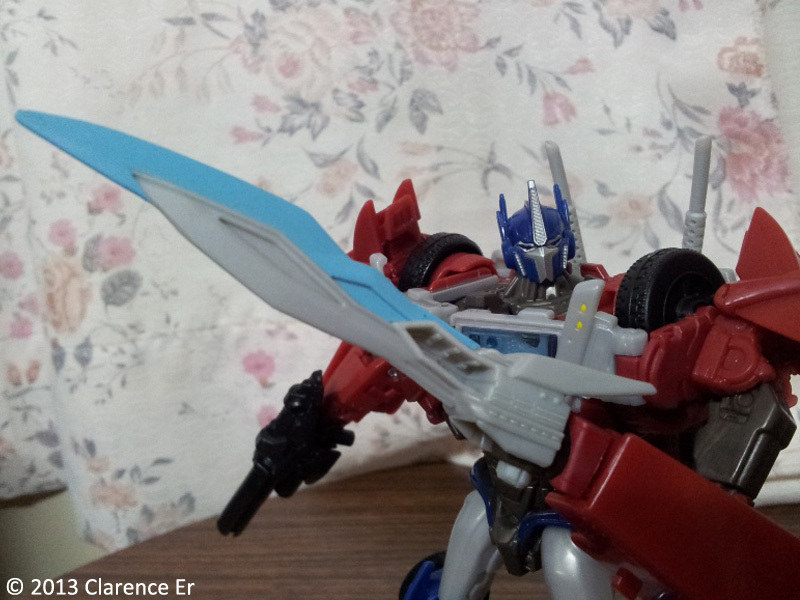 The soft quality of the blade and colour isn’t all that bad though, until you put the sword into Optimus’ hand. It provides the same illusion as the gun where it appears that Prime has a sword arm. Problem is: The blade is upside down. How did that happen? Oh well, at least the designers gave us a sword and a gun for the figure. Due to the sudden cancellation of the First Edition toyline, a newer Robots in Disguise (R.I.D.) 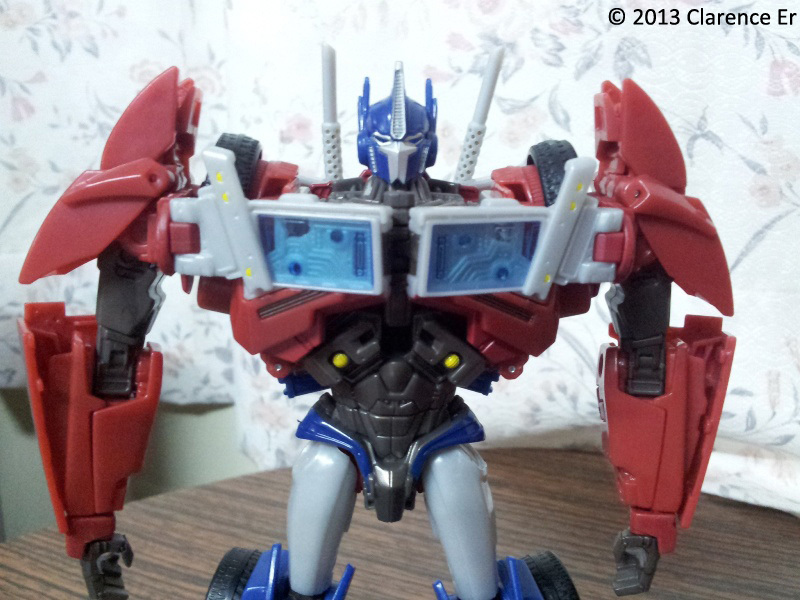 version of Transformers Prime Optimus Prime was released. This one was smaller and had a bigger backpack due to the transformation. Clear blue plastic bits were also noticeable on the forearms which bugged a lot of collectors/buyers. That figure also came with a plastic hand-held sword (no sword arm look) and an ugly large spring-loaded weapon that appears to be a part of the truck and transforms into a gun (and doesn’t lock into place). I do not own that figure due to the noted problems and also because I already own the superior First Edition figure. However, if you cannot find the First Edition Optimus Prime sold at a reasonable price (as close as possible to the retail price), then actually the R.I.D. Optimus Prime is a worthy substitute. Just be forewarned that he’ll come with an ugly spring loaded weapon. So all in all, First Edition Voyager Class Optimus Prime is a highly recommended Voyager class figure. Despite the noted flaws, he is definitely one of the best Optimus Prime figures of all time. Recommended to all even for non-Transformers Prime fans! Both truck and robot modes are excellent and nearly show-accurate. Robot mode is a fantastic sculpt and emotes the Optimus Prime character very well. Highly recommended to all! Oh and the First Edition packagings are very nice.